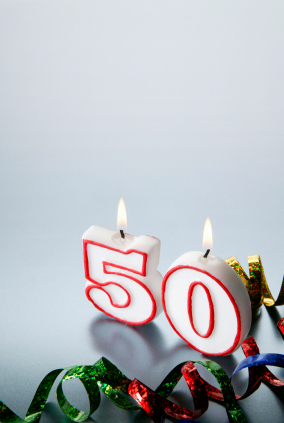 Reaching the half-century mark is a milestone in anyone's life; but, the best way to keep it from turning into a millstone is to enjoy some funny quotes about 50th birthdays. Most of the words of wisdom on aging, and on hitting the 50 mark, seem to be wryly anticipating the incipient decrepitude of old age to come. Which is really a shame, since aging is inevitable, and as one sage said, "it sure beats the alternative!" Or as Daniel Francois Espirit Auber put it: "Aging seems to be the only available way to live a long life." Lady Nancy Astor, born a Virginia southern belle who would marry a landed English lord and become the first woman ever to sit in Parliament, was a well known beauty with a marvelous wit. Her expressions are still repeated to this day. On aging, Lady Astor was particularly sublime: "I reuse to admit I'm more than fifty-two, even if that does make my sons illegitimate." Another British lady, Anita Brookner, won plaudits for her novels and her art historian enterprises. In one of Brookner's books, her narrator makes a dry observation of a female character: "She was a handsome woman of forty-five, and would remain so for many years." These two ladies provide excellent examples of sometimes prickly, but truly funny, 50th birthday quotes. Actress Bette Davis lived a long and tumultuous life, but she certainly hit a few snags in the road in her later years. She suffered a massive stroke that almost killed her, paralyzed her face, and left her unable to walk and able to speak only with a distinct slur. But true to the grit Davis had shown on the silver screen for decades, she forced herself through therapy and managed to stage a comeback even after all the health problems she had been through. Davis' words are a prime example of funny birthday quotes that have the virtue of being almost painfully true. Another famous character actress, Marie Dressler, had been down on her luck after a stage career and early success in silent movies. During that time, Dressler had been kind to a young Marion Davies. When Davies soared to popularity, she rescued Dressler from obscurity and brought her in to make talking pictures. It was a good move. Dressler wowed audiences through a variety of films, and then crowned her achievement with an Academy Award in 1933 at the age of 64. She would unexpectedly die of cancer the following year. Dressler had some words of wisdom, particularly since she had been so poor, and had had an astonishingly successful comeback after she was 60 years old. "By the time we have hit fifty, we have learned our hardest lessons. We have found out that only a few things are really important. We have learned to take life seriously, but never ourselves," Dressler said. "Looking fifty is great if you're sixty." "I'm not fifty. I'm 49.95 plus tax!" Baseball star Mickey Mantle contemplated his senior years with a bit of chagrin. "If I knew I was going to live this long," Mantle said. "I would've taken better care of myself." Maybe the best way to look upon aging is to see it really doesn't matter. An anonymous pundit had the right idea: "Age doesn't matter, unless you're a cheese!" "Funny 50th Birthday Quotes." YourDictionary, n.d. Web. 21 April 2019. <https://quotes.yourdictionary.com/articles/funny-50.html>.